LOL, part of the point for ME to get another bike is to have something I can take the wife out on once in a while so the FXDR won't work. But that's HARDLY the point of the demo fleet (well maybe to Harley, but not to me). I mean, isn't Harley's policy test ride any bike, any day? I don't abuse it and go to dealers just to ride their stock if there's not a chance I might buy. To me the Demo Fleet is more of a chance to try something I might otherwise never ride. Granted, I might change my mind and consider something I wouldn't have otherwise or it might cement in my mind that I want something I thought I did. I certainly have ridden some demos and later bought a number of bikes so it can work that way too. But if you're working a demo event, and there's a brand new bike out there, crap, give it a go man! Give it a GO! LOL, yes I could do a demo ride anytime but never seem to get around to it. If you find out the other dates that truck will be at, please post! thanks. The bad news is some of the search filters do not seem to be working. 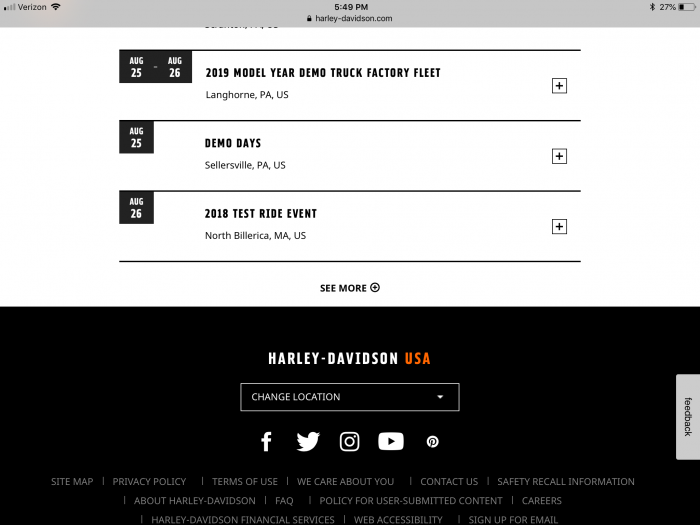 If I filter for “Demo Rides” or for “H-D Demos”, I get no results. If I search “All Events”, Demo Truck events are listed in the results. Last edited by jzink0883; 24th August 2018 at 11:38..
That search comes up with a ton of "dealer demos" but none for the truck. I just did a search for all events within 250 miles of Massachusetts.